The goal box, also called the penalty box, in soccer is an area 18 yards square. It is the area in which the goalkeeper, but no field player, can handle the ball. Its primary purpose, therefore, is to mark out the goalkeeper's area of influence on the pitch. In a full 11-a-side soccer game, players from both sides can freely enter the box, apart from certain specific situations. The rules for a five-a-side game differ. During open play, all field players can freely enter the goal box. Defenders can try to make this difficult for the attackers by using the offside trap, a rule that has changed in its complexities through the years. Offside is when an attacker is goal side to the last defender but without the ball. Attackers and defenders often flood the goal box when the attacking team has a set play like a corner kick or free kick. Attacking players are not allowed inside the goal box when the goalkeeper is restarting the game with a goal kick. The goalkeeper should be the only player in the box at that time. The only time this might differ is if the goalkeeper is having problems with his kicking, due to an injury. 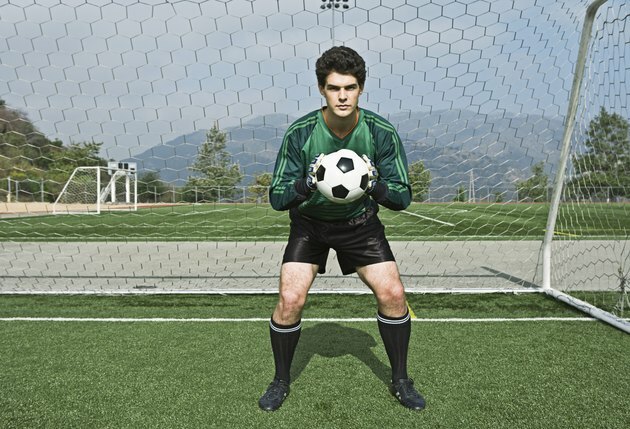 In this case, one of the goalkeeper's teammates can take the goal kick. The penalty kick in soccer is a pressure cooker situation for one player, the penalty taker. This attacker is the only player allowed inside the goal box, other than the goalkeeper, during a penalty. A marked-out area with the shape of a "D" is positioned at the front of the goal box. This is important as it prevents all other field players being within 10 yards of the penalty spot and also gives the taker more room. During a five-a-side soccer game, the rules of the penalty box differ slightly. The shape of the box is just a simple "D," rather than the two boxes and a "D" of a full-size pitch. In five a side, attacking players are not allowed to enter the goalkeeping area. All shots must be taken from outside the area. As there is no offside in five a side, this prevents attackers from goal hanging. It also protects the goalkeeper somewhat from being physically injured.